A special Chianti Classico, which has been produced exclusively for Viking Line by the Italian winery Barone Ricasoli, has also been added to the ship’s traditional wine list. Viking Line’s house wines are picked from hundreds of options, and the finalists fulfil several criteria e.g. ecological production, an excellent quality-price ratio and suitability with dishes and delicacies offered onboard. “We have received outstanding feedback on our selections in earlier years. It’s highly essential for us that our house wines guarantee a brilliant value for money. Our personnel are happy to share their expertise and suggest wines that will best complement any dining experience, both in our restaurants and shops,” says Kim Engblom, Tax Free Manager in Sales & Purchasing at Viking Line. The grapes of the Astronomer Chardonnay, Viking Line’s new house white wine, grow in southern Australia on the award-winning De Bortoli family vineyard. The wine production is based on a wine philosophy that is respected and followed by everyone working for the family vineyards. The meticulously selected production methods give the wine a creamy and robust texture and add to its overall delectability. 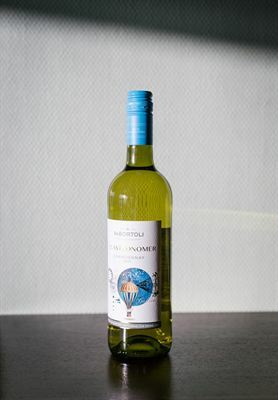 The cool climate together with an unhurried production method lend this dry wine its pleasant peach aroma with a hint of nectarine and vanilla. The suitable acidity of the wine is ideal when paired with e.g. fish or seafood. Viking Line’s featured red wine, Solensis Organic Syrah-Cabernet Sauvignon, was produced by the vineyards of Gérard Bertrand, a passionate ambassador for wines that reflect southern France and the Mediterranean lifestyle. Bertrand is also one of the most significant organic producers in France, as reflected by the wine house’s ECOCERT certification. Centuries of local traditions and modern innovations have been blended optimally in both the farming and production processes. The Solensis Organic Syrah-Cabernet Sauvignon is a full-bodied wine with berry notes and a hint of slightly ripened blackberries. The wine is ideal alongside red meat, a creamy risotto and mature cheeses. During the next two-year period, Viking Line’s house wines will include Barone Ricasoli’s Chianti Classico, a specialty wine sold exclusively on Viking Line’s ships. The grapes of the oldest winery in Italy grow in vineyards 280–480 metres above sea level, and they are harvested by hand in October. The wine has a spicy aroma with hints of dark cherries and mocha. It is a full-bodied, fruity wine with rich berry flavours that is pleasingly tart to the palate. It is at its best when paired with red meat, game and hard cheeses. The ship’s sparkling wines were chosen in co-operation with Viking Line’s own experts and Finland’s first Master of Wine Essi Avellan. Mezza di Messacorona, Viking Line’s sparkling wine of choice, is an elegant bubbly from Trentino Alto Adige region at the foothill of the Dolomites. Its grapes grow at elevations between 400 and 800 metres in the sun of the Italian Alps. The cool climate gives the grapes a natural freshness. The result is a rich and intense sparkling wine whose aroma bears hints of red apple and white peach. It was produced by the Mezzacorona vineyards, active in the region since 1904. A light sparkling wine flavoured with peach, pear and a touch of floral and toasty accents. The crisp and fruity wine works well as an aperitif or partnered with appetizers, salads, vegetable dishes and mild-flavoured fish. The French Piper-Heidsieck Essentiel was selected as the ship’s newly featured champagne. Piper-Heidsieck is the most distinguished champagne producer of our century. This year it was awarded with four medals at the International Wine & Spirit Competition. Piper-Heidsieck’s champagnes charm the tongue with their characteristic crisp, toasty, round and fruity style. A non-vintage champagne produced by the house, Essentiel gains its depth and gastronomic nature from patient aging in the house cellars. The bubbles in this rich and invigorating champagne are delicate and elegant. Its fruity taste is a blend of red apple, pear, white peach and melon. This champagne is ideal served as a social drink, an aperitif or paired with fish and seafood.